“ The Spirit of the LORD is upon Me, because He has anointed Me to preach the gospel to the poor; He has sent Me to heal the broken-hearted, to proclaim liberty to the captives and recovery of sight to the blind, to set at liberty those who are oppressed; To proclaim the acceptable year of the LORD.” Luke: 4 18-19. Elizabeth is thrilled to release I Will Love You, a new song in support of the Syrian Refugee Crisis and Canada's commitment to accept 25,000 refugees over the next few months. The main goal of this “humanitarian” single and video is to encourage Canadians to realize the broad impact our country can make when we extend ourselves in love and with open hearts. Elizabeth is asking the public to share the song links to family and friends through social media channels to embrace our identity as a peace keeping country and say ‘I Will Love You’. 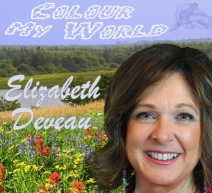 This new single is available on CD Baby and other digital distributors with proceeds to local private Refugee sponsors starting with Birch Cove Baptist Church, 50 Donaldson Avenue, Halifax, NS.